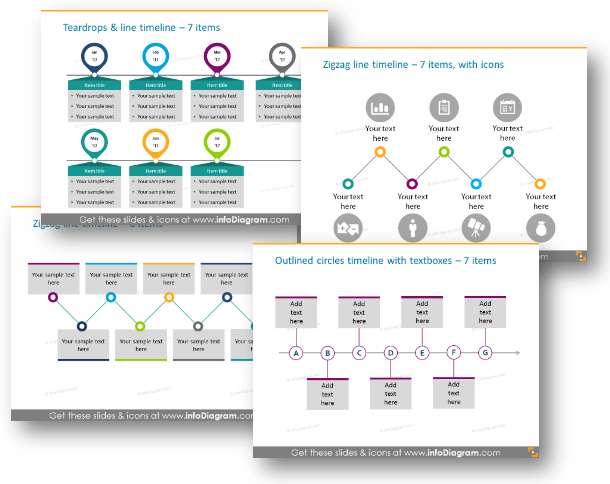 Timeline diagram is a simple visual representation for presenting stories, stages, milestones, deadlines or strategy steps. This article presents several timeline illustrations. 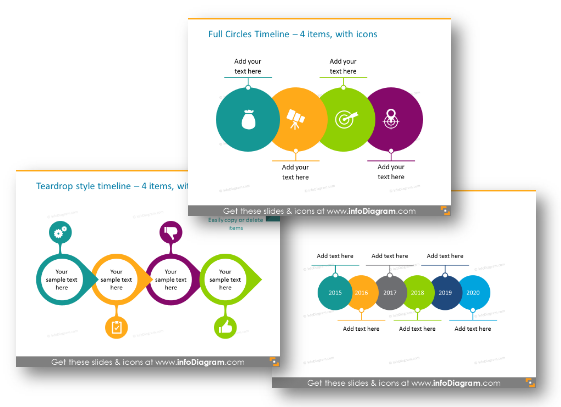 All mentioned graphic is available for download from this Timelines PPT Diagrams Collection. Tracking events horizontally from left to right, like reading a book or using a ruler. 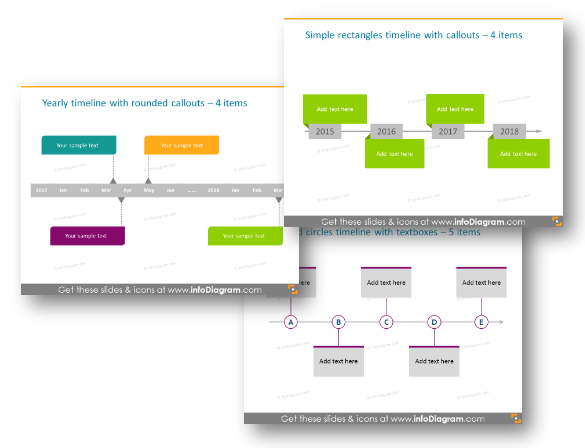 This is the most common type of timeline, suitable for any meeting and presentation. If your idea is to show a close connection between the first and last event, the following timeline type is the best. It is suitable also for longer event sequences, that will not fit into one horizontal line. Having a timeline with only a few events allows you to use stronger design. Such a slide will be more visually attractive than smaller more busy timelines. So you can use it to show the key part of your presentation. Those timelines are good to illustrate core milestones. Consider using vivid colors for these diagrams as below, to bring freshness to your presentation. You may need to present steps, that will guide your team or company to the desired goal? The good idea is to use a timeline, consisting of one main arrow with colored ribbons on it. This design may be not best for showing precise event timing but it’s great to attach attention to a few main milestones for achieving desired results. If you do a business review or plan next year actions, use a monthly calendar design. 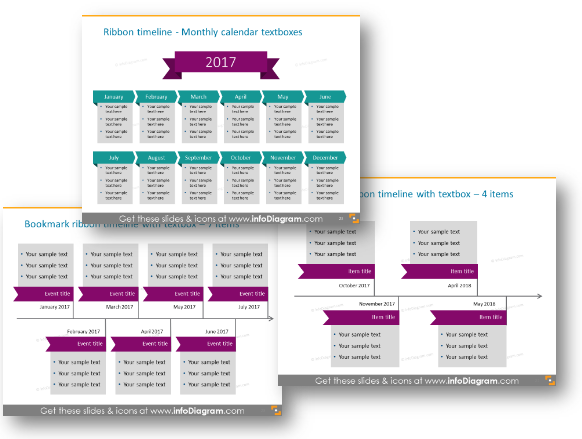 Present specific actions by series of monthly events, each represented by a bookmark or ribbon shapes, where there’s enough place for putting a description for each month. 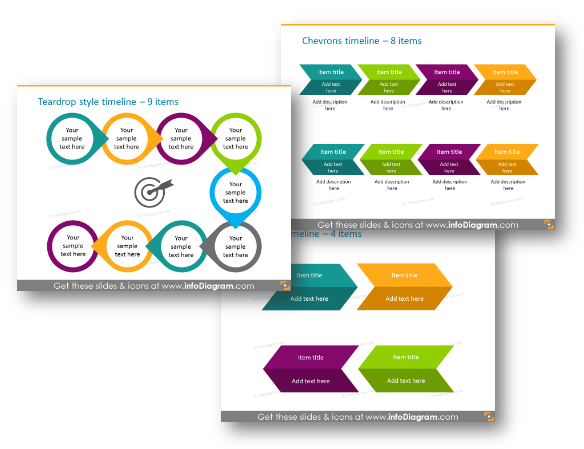 To show a history of events or future objectives over several years period (whether you are talking about a person or company) you can use the timeline designs presented below. Having non-white background helps the slide to stand out. You can replace background image with your company stock photos if needed. If you create a presentation about new directions and strategies, you can choose visual roadmap diagrams. 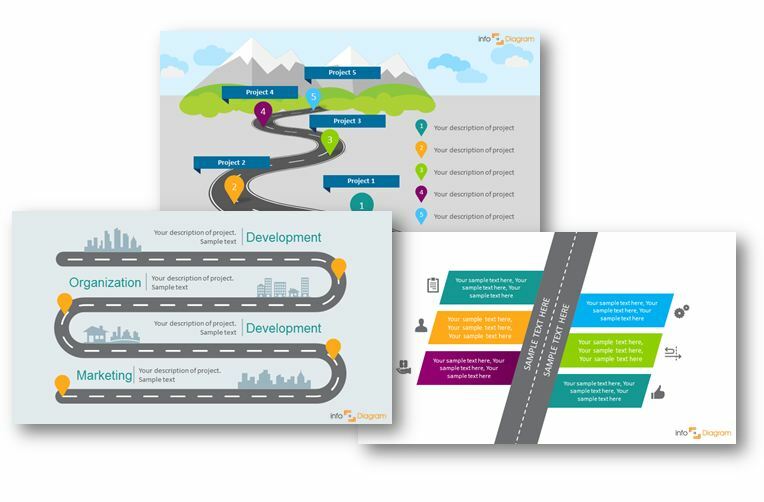 Check our other blog article Three ways to create a roadmap slide. Whatever is your planning level and context, presenting your timelines in a strongly visual way can be a great tool in your communication arsenal. It helps your audience to focus on the story you present and stay motivated by better understanding the pathway you present, whether you talk about future goals, vision or you report past actions. Without such comprehension where we are and where we are going, it’s easy for a team to lose internal motivation. keep consistency within your slides. Use a limited number of fonts and colors. Adapt colors to your company palette. Use one style of icons(e.g. only flat ones). make all text readable – check especially the detail sub-points if you present at a meeting. 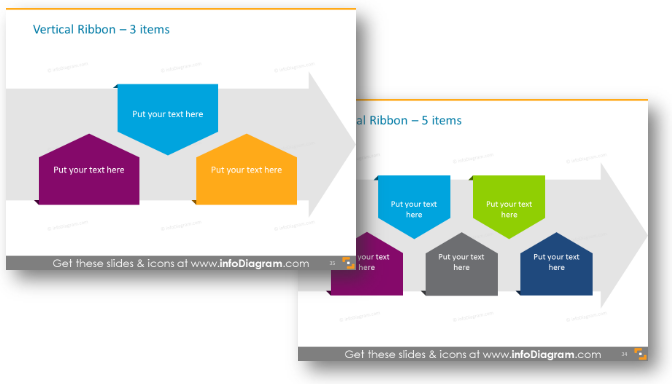 All examples above are from our infoDiagram PowerPoint Diagrams collection. It contains several types of timelines, which can be easily edited and added to other presentation. PS. Which timeline do you find the most suitable for your presentation? Please, let me know in the comments below. I look also for new ideas to design. 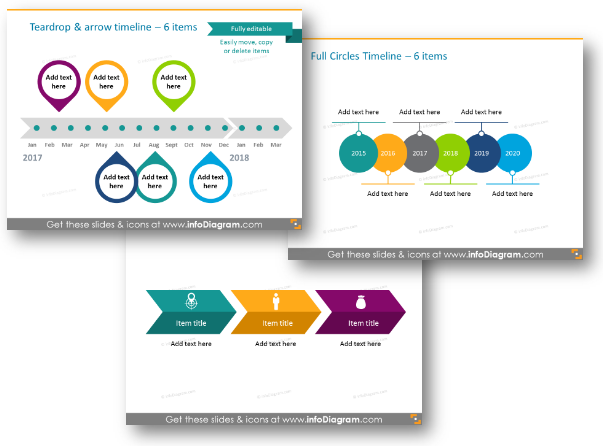 I am looking for PowerPoint templates such as roadmaps and timelines which can come in handy when I am preparing presentation materials. To avail of the ready-to-use templates, do I need to pay anything? If so, how much? Also, how secure is the site? Concerning safety – our website and payments are secure. Plus we offer a money-back refunds if anything should go wrong. we use a professional payment processor company with high security standards (Paypal company) that offers various payer protections.